Like parents trying to protect their children, both indoor and outdoor gardeners want to protect their plants from the bad bugs and pest. How else could they accomplish this without the help of pest control measures? Just as with the same parents-children example, some “protection” could be dangerous. Pest control must be done with utmost consideration to safety; safety in terms of the plants, animals, humans and the environment. This holds especially true for those with vegetable and organic gardens. The main purpose of taking care of vegetables and organic gardens will be wiped out if they become “tainted” with pest control chemicals. Plants are extensions of the beauty of Mother Nature. What benefit could anyone get from chemical-laden flowers and vegetables? Here’s a few tips to make any pest control less damaging or more environment-friendly. These tips are steps for long-term maintenance of your pest control system. This may be accomplished through picking by hand, creating barriers and traps and plugging holes. Breed predatory insects like as Green lacewings which will feed on aphids that just can’t get enough of your foliage. 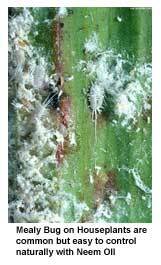 Bacterial insecticides such as B. thuringiensis could also be used against caterpillars. 3. Finally, resort to chemical pest control. Organic pesticides or the least-toxic pest control chemicals must be considered as only the last resort in controlling pests. Some of these not-so-toxic chemicals include neem oil, insecticidal soaps, horticultural oils, dehydrating dusts, etc. Against Green Aphids and Mites – 1 tablespoon of liquid soap and a cup of vegetable oil must be mixed. Dilute a teaspoon of this solution with a cup of water. Then, you can spray this mixture to those annoying aphids and mites. Make sure that ANY chemicals you use for pest control are specific for the insects you are targeting. This could be assured through intently checking on labels. If the insect you would like to kill is not included in the list of the chemical’s target insects, most probably it will not work on that insect. Neem Controls House Plant Pest Naturally!